Requirement: A health platform to support a new generation of patient led services including time-limited sharing of patient data with health care professionals. A cross device mobile app which worked with and without internet connectivity and OCR (optical character recognition) of medicine labels. Solution: Using a single code base we were able to deliver a mobile app which worked on both iPhone and Android. The app connected to the web based database for centralised secure storage of patient entered data. Patients could photograph their medicine labels which were automagically recognised – speeding up the registration process. 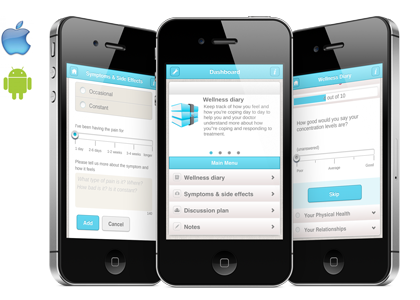 Day-to-day diary entry can be completed offline and synced later when web access became available. Our take: Ensuring a consistent user experience with or without internet access was an interesting challenge. We wanted to avoid exposing the user to any complexity over data versions which meant coding an extra layer of intelligence into both the mobile and server code.